At last week's Toy Fair Wizkids had a variety of their Star Trek games on display, including the first look at their new Star Trek: Frontiers game, and their new big Borg Cube model. Continue below to check them out. 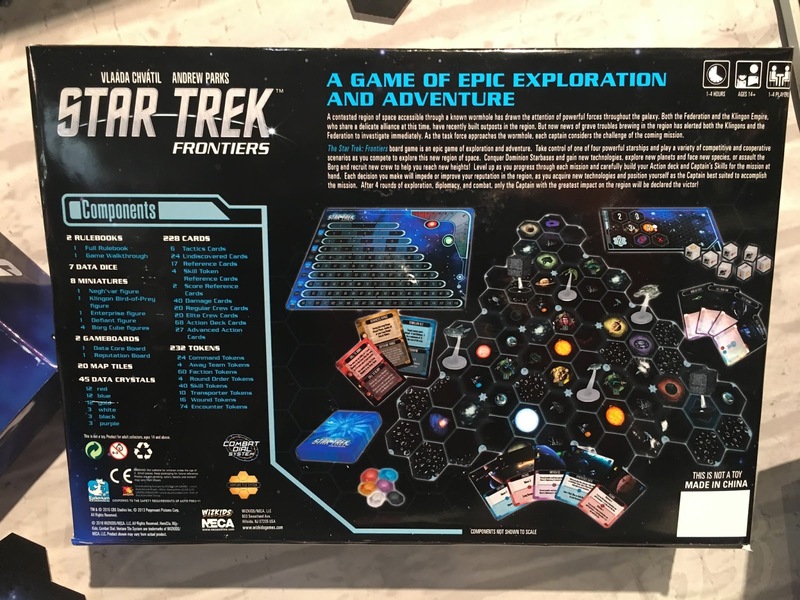 Star Trek: Frontiers, a new game designed by Andrew Parks based on the Venture Tile System from the game Mage Knight, was announced last year, but there has been little news on it, unitl now! On display was the box, and the game setup for play. A contested region of space accessible though a known wormhole has drawn the attention of powerful forces throughout the galaxy. Both the Federation and the Klingon Empire, who share a delicate alliance at this time, have recently built outposts in the region. But now news of grave troubles brewing in the region has altered both the Klingons and the Federation to investigate immediately. As the task force approaches the wormhole, each captain considers the challenge of the coming mission. 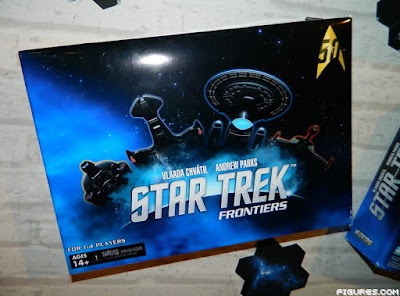 The Star Trek: Frontiers board game is an epic game of exploration and adventure. Take control of one of four powerful starships and play a variety of competitive and cooperative scenarios as you compete to explore this new region of space. Conquer Dominion Starbases and gain new technologies, explore new planets and face new species, or assault the Borg and recruit new crew to help you reach new heights! Level up as you progress through each mission and carefully build your Action deck and Captain's Skills for the mission at hand. Each decision you make will impede or improve your reputation in the region, as you acquire new technologies and position yourself as the Captain best suited to accomplish the mission. After 4 rounds of exploration, diplomacy, and combat, only the Captain with the greatest impact on the region will be declared the victor! Also specified on the box are the ships included, those four hero ships are Galaxy and Defiant class (specifically the Enterprise and Defiant) for the Federation, and Negh'Var and Klingon Bird of Prey for the Klingons. 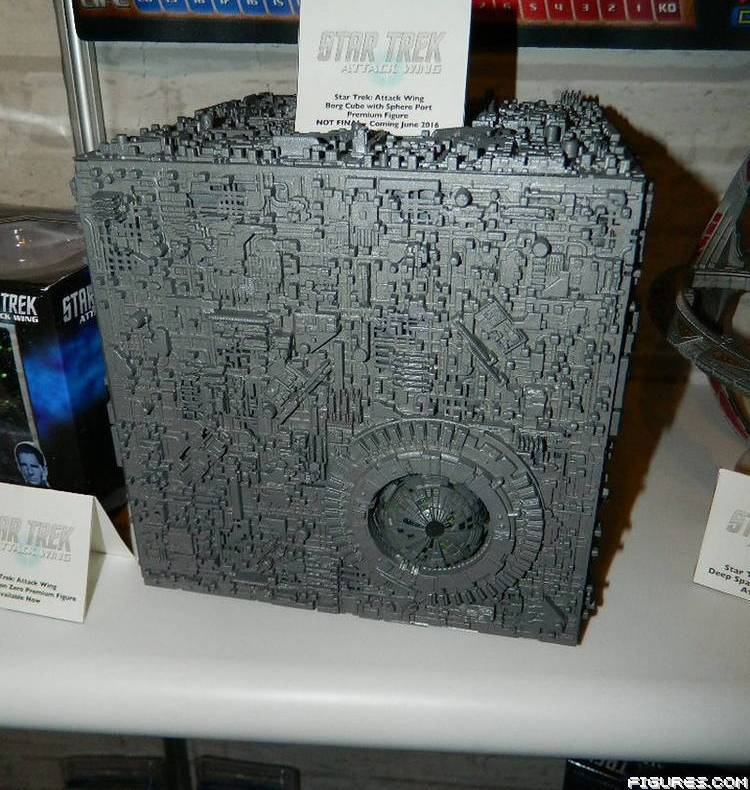 Also included are four Borg Cubes! 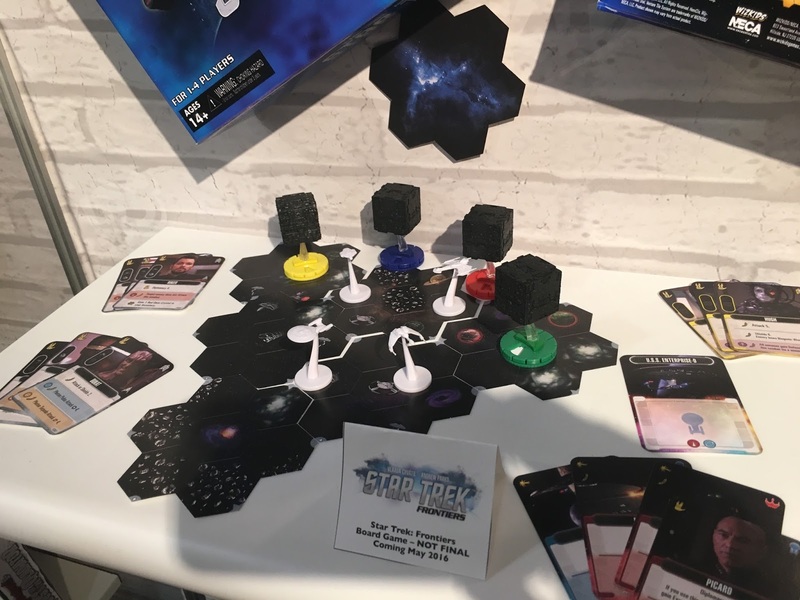 The game on display was marked NOT FINAL, and had non-painted ships, but the box mock-ups do seem to show painted versions, so we'll have to wait and see how pretty this game ends up looking! The game is due to arrive in May. Also seen for the first time is Wizkid's second oversized Borg Cube model for the Attack Wing game. What makes this distinct from the previous big Borg Cube is that it has a port from which a Borg Sphere can launch. The Sphere and Cube are meant to have matching paint jobs in the final release, although again the model on display was marked up NOT FINAL. This ship is expected to arrive in June. Images above come from Figures.com and 13th Dimension, both of which have many more photos of the Star Trek stuff, and everything else Wizkids had on display at Toy Fair, so make sure to check them out.